There will be no Guatemala Retreat this year as Patricia and Surya will be traveling, teaching and studying in India during the time this retreat is normally held. The Mexico retreat will be held over New Years. Above and beyond Mayan spiritual beliefs, there is something mystical about Lake Atitlan. The lake itself is about 50km in diameter, closely surrounded by volcanoes and escarpments that give the appearance of one small community. There are several Mayan communities living along Lake Atitlan’s shores. The relative isolation of the villages surrounding the lake has allowed many of these Mayan communities to maintain their cultural identities and traditions. It is easy to wander through these lakeside villages and get a feel for the Mayan culture. The region around Lake Atitlan has a semi-tropical climate. Day-time temperatures will get up to about 80 degrees Fahrenheit with comfortably cool nights for restful sleep. The dry season from November thru May is the best time to enjoy Villa Sumaya with water temperatures an average of 72 degrees Fahrenheit. The Villa is about a 20 minute walk to the pueblo town of Santa Cruz La Laguna where local people live a quiet life of farming the hills around the village and fishing the lake. You may see more information about Lake Atitlan. The Villa is a 10 minute boat ride from Panajachel, which is a 2.5 hour drive from Guatemala’s international airport in Guatemala City. Private shuttles from the airport may be organized via email. For many it will be easiest to fly into Guatemala City on Friday the day before the retreat and take a 30 minute shuttle to Antigua, the beautiful colonial Spanish City with cobble stone streets surrounded by mountains. You may take a room here for the night and a shuttle to Panajachel Saturday morning. A group shuttle will leave Antigua at 12:30 pm Saturday, February 11 th. Please contact Mickey if you would like to take that. (about a 2 ½ hour ride and approximately $12) The 10 minute boat ride from Panajachel to the villa is about $1.25. You might also arrange your return flight for Sunday, the day after the retreat ends, spending Saturday afternoon and evening after the retreat in Antigua. We will arrange a group shuttle mid-morning Saturday February 18 th for the return to Antigua. There are a wide range of accommodations in Antigua, ranging from a basic, clean room for $10 to luxury rooms in colonial mansions for $200. Most hotels will arrange a shuttle from Guatemala city to the hotel. 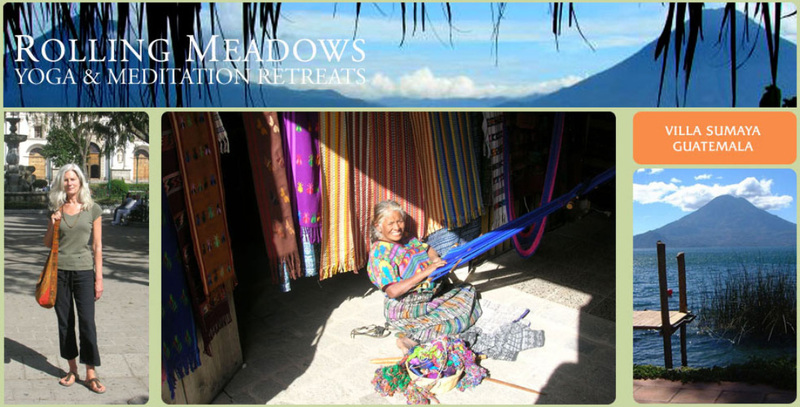 A page of frequently asked questions about this yoga retreat at Lake Atitlan is found by going here. Guatemala City is serviced by many airlines and the fares are often quite reasonable. For more information click on the images for Pages 1 & 2 above right.